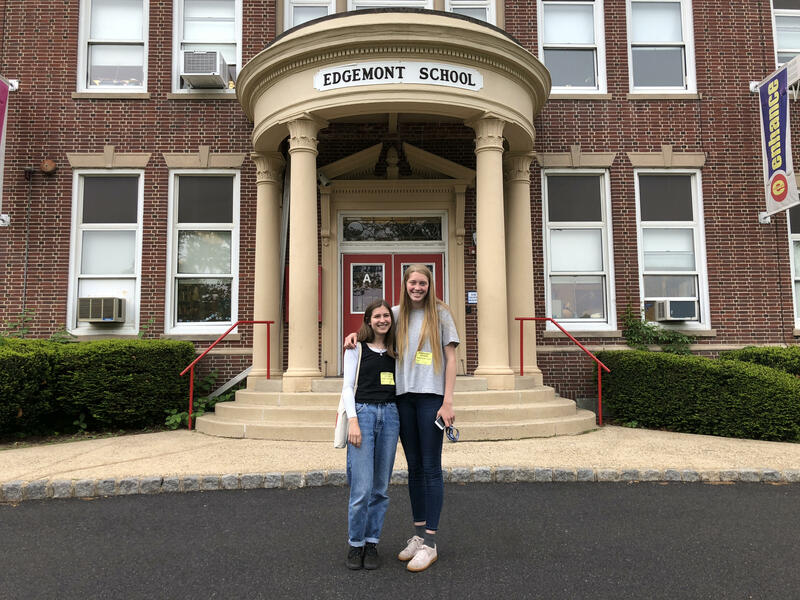 Kayla Phillips and Lily Kelleher earn this week’s senior option spotlight for their interactive internship at Edgemont Montessori School. The Career Internship Program at Montclair High School allows qualified seniors to intern at their preferred company or organization. Kayla Phillips and Lily Kelleher chose to work as assistant teachers at their local elementary school, Edgemont. They are extremely grateful to the Montclair High School guidance for their dedication to the senior option program. Kayla and Lily assist Ms. Dharsi and Ms. Sullivan, their mentors for the program, with the everyday tasks of running a second-grade classroom – helping children with their English class work and shuffling students to different classrooms. In addition to their daily responsibilities, the two have been tasked with creating a large class project that incorporates every student. “We want the project to cover all of the basic subjects in one whole project so that the students can take what they created and their knowledge outside of the classroom,” said Phillips. Lily and Kayla have similar reasons for why they chose to intern Edgemont School for their internship. Kayla Phillips and Lily Kelleher were surprised to learn that running a second-grade classroom was in fact very difficult and even more exhausting. They admire the two teachers who eloquently maintain the classroom and teach the students. Additionally, this internship teaches them that patience is the most important quality. Without it, the students would not fully absorb information and directions for them. Kayla Phillips enjoys forming relationships with her students and watching them interact with each other. Lily Kelleher’s favorite aspect is watching her students “get it” after she helps them with their work. They would both like to thank Ms. Dharsi and Ms. Sullivan for the chance to gain experience for their interests in the near future. During her high school career, Lily Kelleher was involved with the Civics and Government Institute (CGI), Field Hockey, and Track and Field. However, she is passionate about her time as a counselor at the Frost Valley YMCA Camp where she has spent a dozen summers. “This summer I am working at camp with kids who are seven to nine year old, so I am excited to get some experience with younger kids,” Kelleher explained. This upcoming fall, Lily plans on attending Temple University in Philadelphia, where she will pursue a degree in Politics. She hopes that this internship will also allow her to understand younger generations and how to potentially educate them on the future of politics. Kayla Phillips was involved with the Center for Social Justice (CSJ), School of Visual and Performing Arts (SVPA) where she worked onstage and behind, and a student-run acapella group, Passing Notes, during her time at Montclair High School. This fall, she will be attending Bennington College in Vermont and intends on studying Psychology. Phillips mentioned that one day she wants to become a therapist and have her own practice “This is kind of helping me shape who I want to work with when I’m older. Do I want to focus on younger kids, teenagers, or adults?” All of these questions are key things Phillips must think about for her future and this internship is pointing her in the right direction.